We are a leading Wholesaler of pallet stretch wrapping machine, box stretch wrapping machine, reel stretch wrapping machine, semi auto box stretch wrapping machine, auto box stretch wrapping machine and box pre stretch wrapping machine from Hyderabad, India. SPSW 2100 Pallet Stretch Wrappers are designed to wrap stretch film around a loaded pallet. Film provides extra support while the products are being transported & storage to protect them from tip, spill or from being damaged. The wrapping type and times can be designed according to customers' requirements. The ramp is optional. Pallet Stretch wrapper is widely used in chemical industry electronic industry building materials home appliances paper making foodstuff & drink etc. 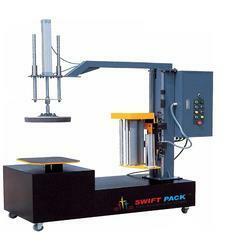 SPSW 350 And SPSW 600 Box Stretch Wrapping Machine could be used for wrapping single cargo or some small cargos combined. 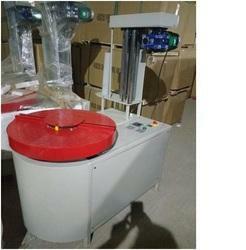 The packing height, fixed film carriage or up-down film carriage can be chosen according to customers request. Heavy duty chain lift, film carriage up and down is clam and safety. 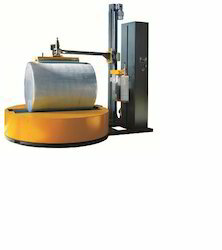 Reel Stretch Wrapping Machine is a machine designed for packing Non-woven, coil, paper roils, rubber product and similar materials manufactured in small reels. This Wrapper is specially designed for packing small and medium sized objects packed in carton box or directly palletized onto the rotating platform without pallet. And the top plate is one option for the unstable goods and ensure it safety packing. 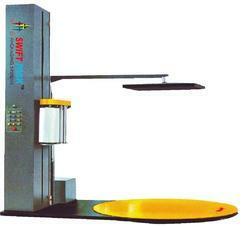 The machine is widely suitable for goods with light weight that can be manually loaded & unloaded from the machine. 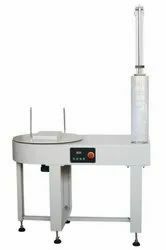 Single (Standard) or Dual roll mounting (optional) or pre stretch model (BWM82) for various size of boxes.Adjustable rod for various box sizes, which eliminates pneumatic top holding. Hence no air connection required for holding of box stretch film tension can be adjustable for tight or loose apply on box.It protect the package against dust and damp, and make the package clean.It can decrease the scratch of the package, improve the surface quality and make the package more secure. For export packing corrugated boxes packing. 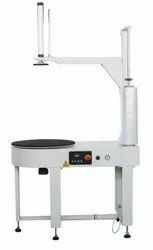 Looking for Stretch Wrapping Machine ?